Today is the day we celebrate and recognize our great employees – whether they are serving our customers and clients, demonstrating our core values through their actions, or innovating to make Altus a better company and place to work. 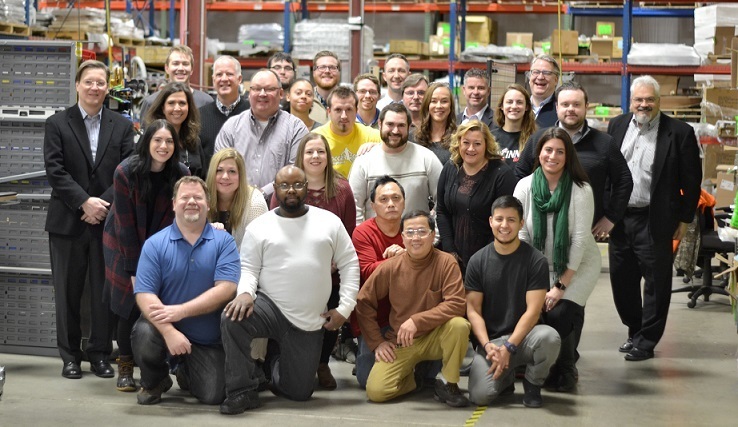 With 35 employees strong, we are a tight-knit community. A community that strives to bring our mission to life, each and everyday. Our employees are everything. They engineer, design, manufacturer and support the most durable, ergonomic and custom mobile workstation solutions on the market. Each department brings its own unique talents, skillsets and perspectives to every project. Altus engineers take our, and our customer’s, ideas and turn them into reality by building truly beautiful products. Of course, it doesn’t happen without testing. So. Much. Testing. Day in, day out, our engineers are on the grind, fine-tuning solutions. We simply couldn’t do it without their “can-do” attitude. 80% of our manufacturing process takes place in the Midwest. Our Manufacturing Team is determined to get the job done, and done well. They are efficient at offering a helping hand whenever, wherever needed. We appreciate their “in it together” perspective. In the field, our six Area Sales Managers are constantly hustling to make a difference around the world. They only give the best care and concern to their clients. They ensure everything is running smoothly from the ground up, from onsite installation to training and program integration. We applaud them for hearing their customers’ wants and needs and translating their feedback back to Altus to better our company. Back at Altus’ base of operations in Grand Rapids, MI, our Customer Service Team goes above and beyond for clients they serve. Their positivity, care and determination on a daily basis is inspiring. They are second to none! Last but not least, it’s not odd to see any of our Altus Leaders out in the field getting their hands dirty. They put their heart and soul into every project they tackle. One of the best parts of working at Altus are your ideas are heard and encouraged. Our leaders are completely open to change as Altus is constantly evolving. It’s truly an exciting time for Altus. As our team and business continues to grow, there is no doubt you can’t feel the excitement in the air. Our team deserves this special day to celebrate all that we have contributed to make the past 17+ years a success for Altus and those we serve. We can’t wait to see what the future brings! Founded in Grand Rapids, MI, Altus serves clients such as Spectrum Health, University of Michigan, Rush University Medical Center and Colorado Children's Hospital. Because of our team, Altus is making the healthcare world a greater place by increasing clinician and patient satisfaction and productivity. Altus is committed to building the most durable, safe and custom mobile and wall mounted workstations.